Glenda Gilmore recovers the rich nuances of southern political history by placing black women at its center. She explores the pivotal and interconnected roles played by gender and race in North Carolina politics from the period immediately preceding the disfranchisement of black men in 1900 to the time black and white women gained the vote in 1920. 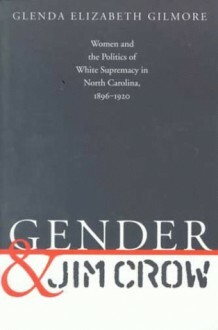 Gender and Jim Crow argues that the ideology of white supremacy embodied in the Jim Crow laws of the turn of the century profoundly reordered society and that within this environment, black women crafted an enduring tradition of political activism.According to Gilmore, a generation of educated African American women emerged in the 1890s to become, in effect, diplomats to the white community after the disfranchisement of their husbands, brothers, and fathers. Using the lives of African American women to tell the larger story, Gilmore chronicles black women's political strategies, their feminism, and their efforts to forge political ties with white women. Her analysis highlights the active role played by women of both races in the political process and in the emergence of southern progressivism. In addition, Gilmore illuminates the manipulation of concepts of gender by white supremacists and shows how this rhetoric changed once women, black and white, gained the vote.